let's join together to contend for a move of God in your area. The College of Prayer is both catalytic and strategic. Our strategy is to create dynamic God-encountering prayer environments that provide a continuity of gatherings we call "modules" by establishing a "campus" which is committed to teaching our 3 years of core curriculum and providing life-giving mentorship. People are looking for substance and are hungry for an authentic spiritual life. As Christ taught His early followers, He is teaching many of us that the spiritual reality we long for is found not in another conference, but at the throne of God. We provide a dynamic environment in which study and spiritual mentoring can take place. Unlike conferences, seminars or even prayer summits, the College of Prayer local campus offers a continuity of nine modules over three years in which relationships can be fostered and life-changing principles can be embraced. Our ministry is non-denominational and one of our core values is that each campus be a gathering place for many different churches. God moves when churches unite, and the best place to cultivate unity is in a God-encountering, Christ-exalting, prayer-filled environment. Time and again we have seen the blessing of God at our campuses when churches lay down the sword of division and pick up the mantel of unity. We have discovered that there are really very few critical issues that divide us, and there is much more around the cause of Christ that unites us. Pray. Ask God for wisdom, anointing and timing. Contact the Regional Director in your area. Click here to find information on your point-of-contact. Download and review the Manual of the College of Prayer International. Begin to cast the vision of the College of Prayer with a small group of influencers and evaluate interest. Try to include pastors, intercessors, Christian ministry leaders and marketplace leaders. Schedule a two day Prayer on Fire Gathering.This gathering is a "taste and see" event for the College of Prayer. It is a worship-based extended prayer gathering that includes high worship, deep repentance and intercession for your area. We are happy to come and facilitate this for you. Out of the Prayer on Fire Gathering you will discover potential key leaders raised up to form the Servant Leadership Team for a College of Prayer campus in your area. Begin cultivating relationship with them and planning for a campus launch. The Regional Director in your area will work with you to determine readiness and to discuss commitments, training and next steps. Ready to launch? 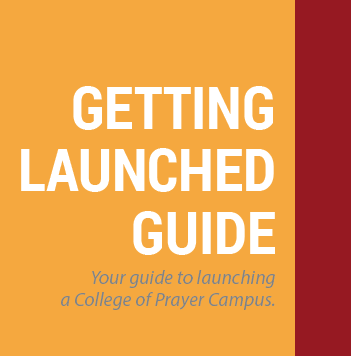 Click here to discover all the resources you need to launch your campus. God provided encouragement and hope for Mississippi. I have seen this weekend the Church in unity ... coming together and exhibiting hunger for the Lord and learning to truly pray the way Jesus has ordained and to accomplish God's desires. Not ready to launch a campus, but still want to partner with us?